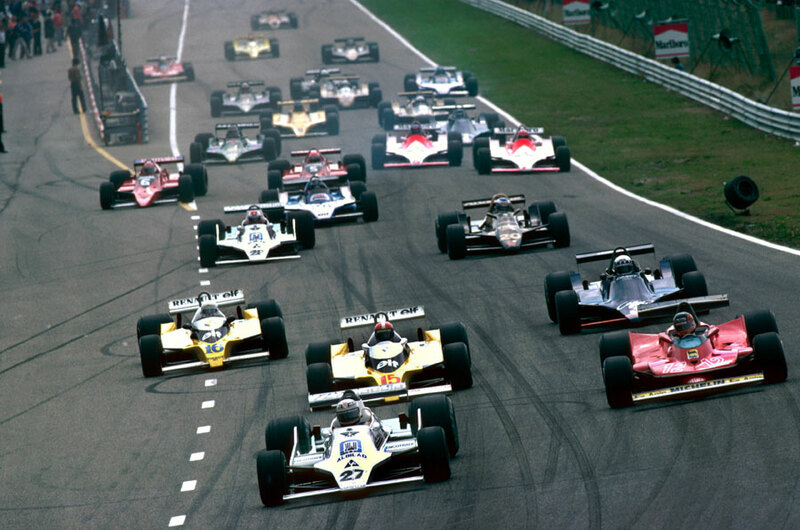 Alan Jones scored his third successive win at the Dutch Grand Prix, at Zandvoort, but the peculiarities of the tweaked scoring system meant it made little impact on the drivers' championship. With only the best four results from each half of the competition counting, Jones' poor early-season form meant he could not catch Jody Scheckter. Jones did not have things all his own way and, but for the spectacular retirement of Gilles Villeneuve late on, his gearbox troubles would have seen him finish second. From the third row of the grid, Villeneuve was in second at the end of the first lap and in the lead by the 11th.. He retained a three-second lead over Jones until his rear tyre exploded on the 47th lap sending him into a high-speed spin. To the delight of the crowd, he refused to accept his race was over and sped back the 4km to the pits on three wheels with his car spewing sparks. By the time he pulled into the Ferrari garage he had destroyed the car's rear suspension. Scheckter (Ferrari) overcame an overheating clutch at the start which relegated him to 18th to take second while Jacques Lafitte (Ligier) finished third. Keke Rosberg (Wolf) drove well to climb to fourth before he retired halfway through. Two of the pre-race favourites were eliminated within a lap. Rene Arnoux made a customary slow start from pole in his turbocharged Renault and came together with Clay Regazzoni's Williams as he tried to squeeze through from the second row. The collision sparked a wave of braking behind them, but Jean-Pierre Jarier was unable to avoid piling into Carlos Reutemann. Jarier continued but Reutemann was unable to.